Alexander Skarsgård is no stranger to gay kisses, and he even picked his True Blood co-star Ryan Kwanten as “the best kisser“. 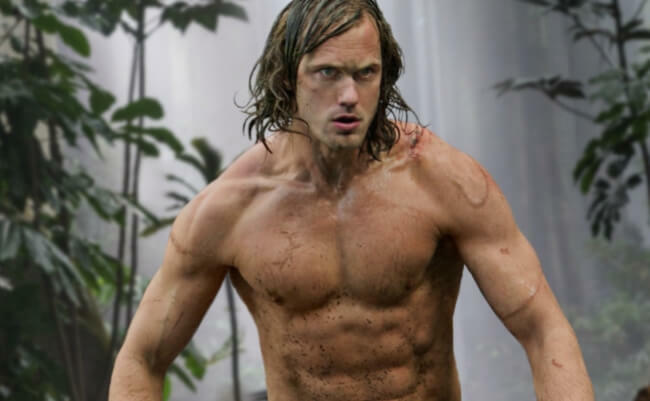 But on the new Legend of Tarzan, we WON’T be seeing Skarsgard kissing another man – even though such a kiss WAS filmed. Originally, the film had a scene where the evil Captain Leon Rom (Christoph Waltz) kisses the unconscious Tarzan (Skarsgard), and then tells his wife “Your husband’s wildness disturbs me more than I can even express”. That sentence was kept in the film (and can even be heard in the trailer), but the kiss itself was cut. Director David Yates spoke to The Times, and said test audiences were left “perplexed” by the kiss. “We pared it back because it was almost too much. It was this really odd, odd moment when Christoph kisses him.